Los Angeles is the largest city in the state of California and the second-largest in the United States. The city's population is approximately 3.8 million. The Greater Los Angeles Area is home to nearly 13 million people from all over the globe, including the largest Latino and Asian populations in the United States. The citizens of Los Angeles speak more than two hundred different languages. Los Angeles is the county seat of Los Angeles County, California, the most populous county in the United States. The city's most popular nickname is "City of Angels," and its inhabitants call themselves "Angelenos." Los Angeles and California became part of the United States at the end of the Mexican-American War in 1848. Los Angeles is today one of the world's most prominent centers of culture, technology, and international trade. It is home to world-renowned institutions covering a broad range of professional and cultural fields. The city and its immediate vicinity lead the world in producing popular entertainment. Los Angeles has a total area of 498.3 square miles (1,290.6 km²), making it the 14th largest city in land area in the United States. The highest point in Los Angeles is Mount Lukens. Located at the far reaches of the northeastern San Fernando Valley, it reaches a height of 5,080 feet (1,548 m). The major river is the Los Angeles River, which is largely seasonal. The river is lined in concrete for almost its entire length as it flows through the city on its way to the Pacific Ocean. Los Angeles is subject to earthquakes due to its location in the Pacific Ring of Fire. The geologic instability produces numerous fault lines both above and below ground, which altogether cause approximately 10,000 earthquakes every year. One of the major fault lines is the San Andreas Fault. Located at the boundary between the Pacific Plate and the North American Plate, it is predicted to be the source of Southern California's next big earthquake. Parts of the city are also vulnerable to Pacific Ocean tsunamis. The city is situated in a Mediterranean climate, experiencing mild, somewhat wet winters and warm to hot summers. Breezes from the Pacific Ocean tend to keep the beach communities of the Los Angeles area cooler in summer and warmer in winter than those further inland. Coastal areas also see a phenomenon known as the "marine layer," a dense cloud cover caused by the proximity of the ocean that helps keep the temperatures cooler throughout the year. Echo Park, Los Angeles, California, as seen with lotus plants and palm trees. Temperatures in the summer can get well over 90°F (32°C), but average summer daytime highs in downtown are 82°F (27°C). Winter daytime high temperatures average 65°F (18°C), and during this season rain is common. The warmest month is August, followed by July and then September. 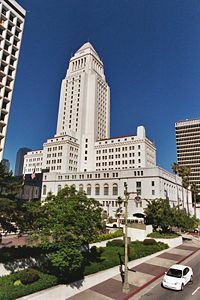 The highest temperature recorded for Downtown Los Angeles was 112.0°F (44.4°C) on June 26, 1990, and the lowest temperature recorded was 24.0°F (−5.0°C) on January 9, 1937. Rain occurs mainly in the winter and spring months (February being the wettest month), with great annual variations in storm severity. Los Angeles averages 15 inches (38 cm) of precipitation per year. Snow is rare in the city basin, but mountainous slopes within city-limits typically receive snow every year. The Los Angeles area is rich in native plant species due in part to a diversity in habitats, including beaches, wetlands, and mountains. The most prevalent botanical environment is coastal sage scrub, which covers the hillsides in combustible California chaparral and woodlands. Native plants include: California poppy, matilija poppy, toyon, coast live oak, and giant wild rye grass. Many of these native species, such as the Los Angeles sunflower, have become so rare as to be considered endangered. Though they are not native to the area, the official tree of Los Angeles is the tropical Coral Tree and the official flower is the Bird of Paradise. Hills of Griffith Park with downtown L.A. in the background. 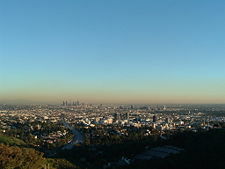 Griffith Observatory is seen to the left and an abundance of smog lingers over Downtown Los Angeles in the center. The city is divided into many neighborhoods, many of which were towns that were annexed by the growing city. There are also several independent cities in and around Los Angeles, but they are popularly grouped with the city of Los Angeles, either due to being completely engulfed as enclaves by Los Angeles, or lying within its immediate vicinity. Some neighborhoods have sought to secede and form their own cities but none of the proposals have been approved by voters. Over half a million remains of Ice age animals have been recovered from the La Brea Tar Pits. The Los Angeles coastal area was first settled by humans at least 25,000 years ago. The remains of "Los Angeles Man" have been dated to 23,000 B.C.E. About 8,000 B.C.E. the Chumash people settled in the area, succeeded about 200-300 C.E. by the Tongva Native American tribe. The first Europeans arrived in 1542 under Juan Rodríguez Cabrillo, a Portuguese explorer who claimed the area as the "City of God" for the Spanish Empire but continued with his voyage and did not establish a settlement. The next contact would not come until 227 years later, when Gaspar de Portolà, together with Franciscan missionary Juan Crespi, reached the present site of Los Angeles on August 2, 1769. Crespi noted that the site had the potential to be developed into a large settlement. In 1771, Franciscan friar Junipero Serra built the Mission San Gabriel Arcangel near Whittier Narrows, in what is now called San Gabriel Valley. In 1777, the new governor of California, Felipe de Neve, recommended to the viceroy of New Spain that the site recommended by Juan Crespi be developed into a pueblo. The town was founded on September 4, 1781, by a group of 44 settlers of Filipino, Native American, African, and Spanish ancestry, with two-thirds being mestizo or mulatto. The settlement remained a small ranch town for decades, but by 1820, the population had increased to about 650 residents. Today, the pueblo is commemorated in the historic district Olvera Street, the oldest part of Los Angeles. By 1900, the population had grown to more than 100,000 people, which began to put pressure on the city's water supply. The 1913 completion of the Los Angeles aqueduct, under the supervision of William Mulholland, assured the continued growth of the city. In 1915, Los Angeles began annexation of dozens of neighboring communities without water supplies of their own. In the 1920s, the motion picture and aviation industries flocked to Los Angeles. In 1932, with the population surpassing one million, the city hosted the Summer Olympics. This period also saw the arrival of exiles from the increasing prewar tension in Europe, including Thomas Mann, Fritz Lang, Bertolt Brecht, Arnold Schoenberg, and Lion Feuchtwanger. World War II and the expansion of defense industries brought new growth and prosperity to the city. Thousands of African Americans migrated from Texas, Louisiana, and Mississippi to work in the expanding industries. However, the state succumbed to war fears and transported most Japanese-American residents from Los Angeles and other cities to distant internment camps for the duration of the war. The postwar years saw an even greater boom as urban sprawl expanded the city into the San Fernando Valley. As in other major cities, long-unresolved racial problems erupted in the 1960s and 1970s. 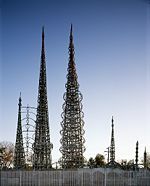 Los Angeles grappled with the Watts riots in 1965, the high school walkout by Chicano students in 1968, and the 1970 Chicano Moratorium, as representative of racial strife within the city. In 1984, the city hosted the 1984 Summer Olympics. The rest of the 1980s were plagued by an increase in gang violence when crack cocaine became wildly available. Racial tensions surfaced again in 1991 with the Rodney King controversy and the large-scale riots that followed the acquittal of his attackers. Despite propositions by San Fernando Valley and Hollywood sections to secede from the city in 2002, residents voted down secession. The 2000s have seen a rise in urban redevelopment and gentrification in various parts of the city, most notably Echo Park and Downtown Los Angeles. The city is governed by a mayor-council system. There are 15 city council districts. Other elected city officials include the city attorney, who prosecutes misdemeanors within the city limits, and the city controller. The city government has been perceived as inefficient and ineffective by residents of some areas, which led to an unsuccessful secession effort by the San Fernando Valley and Hollywood in 2002. The campaign to defeat secession was led by then Mayor James Hahn. The most common complaint is that the city administration in Downtown gives priority to high-density neighborhoods like Mid-City and Downtown at the expense of its far-flung suburban neighborhoods. As the city does not have officially named districts, most areas and neighborhoods are known either by the names given by tract developers when first developed, or by the names of principal neighborhood streets, or by the names of the formerly independent communities that were annexed by the city. Voters created neighborhood councils in the Charter Reform of 1999. They were designed to promote public participation in government and make it more responsive to local needs. The councils cover districts, which are not necessarily identical to the traditional neighborhoods of Los Angeles. Almost ninety neighborhood councils (NCs) are certified and all "stakeholders"—meaning anyone who lives, works, or owns property in a neighborhood—may vote for members of the councils' governing bodies. The first notable concern of the neighborhood councils collectively was the opposition by some of them in March 2004 to an 18 percent increase in water rates by the city's Department of Water and Power. This led the City Council to approve only a limited increase pending independent review. The neighborhood councils have been allocated $50,000 each for administration, outreach, and approved neighborhood projects. 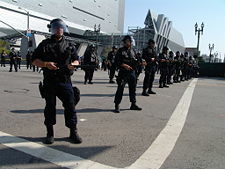 The Los Angeles Police Department during May Day 2006 in front of the new Caltrans District 7 Headquarters. Los Angeles has been experiencing significant decline in Part I offenses since the mid-1990s, and hit a record low in 2006, with 29,737 acts of violence, of which 481 were homicides. The distribution of homicides in the city is uneven, with nearly half occurring in South Los Angeles and the Harbor area. Another quarter occur Downtown and in its environs. Property crimes were over three times more common than violent crimes; 102,297 were recorded in 2006. According to a May 2001 Drug Threat Assessment by the National Drug Intelligence Center, Los Angeles County was then home to 152,000 gang members organized into 1,350 gangs. Among the most infamous are the Crips, Bloods, 18th Street gang, Florencia 13, and MS-13 (Mara Salvatrucha). This has led to the city being referred to as the "Gang Capital of America." Car chases happen more often than in most other major cities, with the city's complex freeway system allowing for lengthier pursuits. Other automobile-oriented crimes include car-to-car shootings, drive-by shootings, freeway shootings, hit and run accidents, and carjackings. 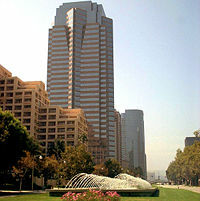 Fox Plaza, headquarters for 20th Century Fox, in Century City, a major financial district for West Los Angeles. The economy of Los Angeles is driven by international trade, entertainment (television, motion pictures, and recorded music), aerospace, technology, petroleum, fashion, apparel, and tourism. Los Angeles is also the largest manufacturing center in the United States. The contiguous ports of Los Angeles and Long Beach together comprise the most significant port in North America and one of the most important ports in the world, and they are vital to trade within the Pacific Rim. Other significant industries include media production, finance, telecommunications, law, health and medicine, and transportation. 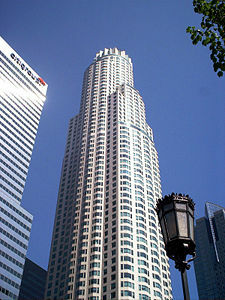 For many years, up until the mid-1990s, Los Angeles was home to many major financial institutions in the western United States, including First Interstate Bank, which merged with Wells-Fargo in 1996; Great Western Bank, merged with Washington Mutual in 1998; and Security Pacific National Bank, which merged with Bank of America in 1992. Los Angeles was also home to the Pacific Stock Exchange until it closed in 2001. The city is home to five major Fortune 500 companies, including aerospace contractor Northrop Grumman, energy company Occidental Petroleum, health-care provider Health Net, homebuilding company KB Home, and metals distributor Reliance Steel & Aluminum. The University of Southern California (USC) is the city's largest private- sector employer. The metropolitan area contains the headquarters of even more companies, many of which wish to escape the city's high taxes. For example, Los Angeles charges a gross receipts tax based on a percentage of business revenue, while many neighboring cities charge only small flat fees. The L.A. area is also home to the U.S. headquarters of all but two of the major Asian automobile manufacturers. Further, virtually all the world's automakers have design and/or tech centers in the L.A. region. 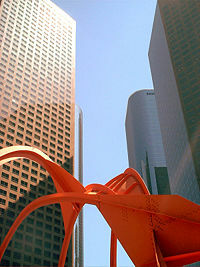 Downtown Los Angeles is the home of the Los Angeles Convention Center, which hosts many popular events. Los Angeles has 27 intertwining freeways handling millions of commuters on a daily basis. Los Angeles is the most car-populated metropolis in the world with one registered automobile for every 1.8 people. The Los Angeles County Metropolitan Transportation Authority and other agencies operate an extensive system of bus lines, as well as subway and light rail lines. Los Angeles' mass transit system does not have high per capita ridership, with 10.5 percent of commuters using public transit, compared with 53 percent and 30 percent in New York City and Chicago, respectively. The Los Angeles metropolitan area is served by more airports than any other city in the world. There are six commercial airports and many more general-aviation airports. The main Los Angeles airport is Los Angeles International Airport. The fifth busiest commercial airport in the world and the third busiest in the United States, LAX handled over 61 million passengers and 2 million tons of cargo in 2006. The Port of Los Angeles is located in San Pedro Bay, approximately 20 miles (30 km) south of Downtown Los Angeles. The port complex occupies 7,500 acres (30 km²) of land and water along 43 miles (69 km) of waterfront. It adjoins the separate Port of Long Beach. The Port of Los Angeles along with the Port of Long Beach comprise the largest seaport complex in the United States and the fifth busiest in the world. LAX, the fifth busiest airport in the world. A view of the Vincent Thomas Bridge reaching Terminal Island. Today, Los Angeles has a population of 3.8 million, making it the second largest city in the nation. With the city's size comes the 74-story US Bank Tower, the tallest building in the United States west of the Mississippi River. Los Angeles is home to people from more than 140 countries speaking 224 different languages. Ethnic enclaves like Chinatown, Historic Filipinotown, Koreatown, Little Armenia, Little Ethiopia, Tehrangeles, Little Tokyo, and Thai Town provide examples of the polyglot character of Los Angeles. The 2010 United States Census reported that Los Angeles had a population of 3,792,621. The population density was 7,544.6 people per square mile (2,913.0/km²). The Census reported that 3,708,020 people (97.8 percent of the population) lived in households, 58,186 (1.5 percent) lived in non-institutionalized group quarters, and 26,415 (0.7 percent) were institutionalized. The age distribution was 874,525 people (23.1 percent) under 18, 434,478 people (11.5 percent) from 18 to 24, 1,209,367 people (31.9 percent) from 25 to 44, 877,555 people (23.1 percent) from 45 to 64, and 396,696 people (10.5 percent) who were 65 or older. The median age was 34.1 years. For every 100 females there were 99.2 males. For every 100 females age 18 and over, there were 97.6 males. There were 1,413,995 housing units—up from 1,298,350 during 2005–2009—at an average density of 2,812.8 households per square mile (1,086.0/km²), of which 503,863 (38.2 percent) were owner-occupied, and 814,305 (61.8 percent) were occupied by renters. The homeowner vacancy rate was 2.1 percent; the rental vacancy rate was 6.1 percent. 1,535,444 people (40.5 percent of the population) lived in owner-occupied housing units and 2,172,576 people (57.3 percent) lived in rental housing units. According to the 2010 United States Census, Los Angeles had a median household income of $49,745, with 21.2 percent of the population living below the federal poverty line. According to the 2010 Census, the racial makeup of Los Angeles included: 1,888,158 Whites (49.8 percent), 365,118 African Americans (9.6 percent), 28,215 Native Americans (0.7 percent), 426,959 Asians (11.3 percent), 5,577 Pacific Islanders (0.1 percent), 902,959 from other races (23.8 percent), and 175,635 (4.6 percent) from two or more races. Hispanics or Latinos of any race were 1,838,822 persons (48.5 percent). Non-Hispanic whites were 28.7 percent of the population in 2010, compared to 86.3 percent in 1940. Mexicans make up the largest ethnic group of Latinos at 31.9 percent of Los Angeles' population, followed by Salvadorans (6.0 percent) and Guatemalans (3.6 percent). The Latino population is spread throughout the city of Los Angeles and its metropolitan area but it is most heavily concentrated in the East Los Angeles region, which has a long established Mexican American and Central American community. 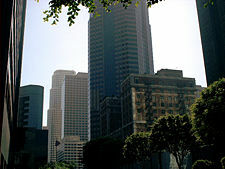 The largest Asian ethnic groups are Filipinos (3.2 percent) and Koreans (2.9 percent), which have their own established ethnic enclaves−Koreatown in the Wilshire Center and Historic Filipinotown. Chinese people, which make up 1.8 percent of Los Angeles' population, reside mostly outside of Los Angeles city limits and rather in the San Gabriel Valley of eastern Los Angeles County, but make a sizable presence in the city, notably in Chinatown. Chinatown and Thaitown are also home to many Thais and Cambodians, which make up 0.3 percent and 0.1 percent of Los Angeles' population, respectively. Japanese comprise 0.9 percent of L.A.'s population, and have an established Little Tokyo in the city's downtown, and another significant community of Japanese Americans is located in the Sawtelle district of West Los Angeles. Vietnamese make up 0.5 percent of Los Angeles' population. Indians make up 0.9 percent of the city's population. African Americans have the largest establishment in South Los Angeles, including the industrial neighborhoods of Crenshaw and Watts. In 1970, the Census Bureau reported city's population as 17.9 percent black, 61.1 percent non-Hispanic white and 17.1 percent Hispanic. However, since the 1980s, there has been a large influx of immigration from Mexico and Central America which have outnumbered the blacks in South Los Angeles. South Los Angeles, as well as neighboring communities such as the city of Compton that were home to predominant African American populations are now transforming into Hispanic communities. Pacific Islanders make up 0.1 percent of Los Angeles' population, and are concentrated in southwestern Los Angeles County, namely in Long Beach and Carson, which are home to thousands of Samoan Americans. While many other American cities have experienced central area population declines, the opposite was true in Los Angeles, due in part to the city's large immigrant population. In the period from 1920 to 1960, African Americans from the Southeast arrived in Los Angeles, swelling its population by 15 times. Since 1990, the African-American population has dropped as its middle class relocated to the suburbs. Latinos have moved into the once predominantly African-American district of South Los Angeles. Los Angeles experienced minor waves of European immigration in the late 1800s and early 1900s and the city has sizable populations of German, Greek, Irish, Italian, Romanian, Romani, Polish, Portuguese, Serb, Spanish, Lebanese, Croatian, and Ukrainian descent. 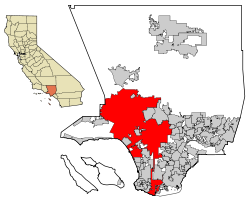 Los Angeles Unified School District (LAUSD) serves most of the city of Los Angeles, as well as several surrounding communities, with a student population of over 800,000. LAUSD is the second largest school district in the United States; only the New York City Department of Education is larger. After Proposition 13 was approved in 1978, urban school districts had considerable trouble with funding. LAUSD has become known for its underfunded, overcrowded, and poorly maintained campuses, although its 162 magnet schools help compete with local private schools. There are three public universities located within the city limits—California State University, Los Angeles; California State University, Northridge; and University of California, Los Angeles (UCLA)—as well as a number of private colleges, including the University of Southern California. The community college system consists of nine campuses. The Los Angeles Central Library in Downtown Los Angeles. 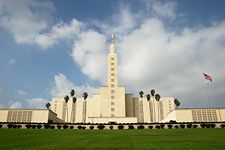 Built in 1956, the Los Angeles Temple of The Church of Jesus Christ of Latter-day Saints is the second largest Mormon temple in the world. 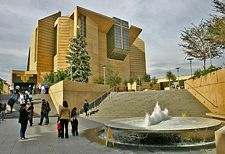 The Cathedral of Our Lady of the Angels is the mother church of the Roman Catholic Archdiocese of Los Angeles. 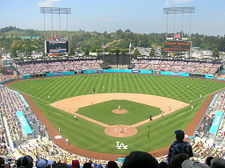 Los Angeles is the home of the Los Angeles Dodgers of Major League Baseball, the Los Angeles Kings of the National Hockey League, and the Los Angeles Lakers of the National Basketball Association. Los Angeles is also home to the USC Trojans and the UCLA Bruins in the NCAA, both of which are Division I teams in the Pacific 10 Conference. UCLA has more NCAA national championships, all sports combined, than any other university in America. USC has the third most NCAA national championships, all sports combined, in the United States. Los Angeles has twice played host to the summer Olympic games, in 1932 and in 1984. Super Bowls I and VII were also held in the city, as well as soccer's international World Cup in 1994. In addition, beach volleyball and windsurfing were both invented in the area. Los Angeles is the only major city in the United States bisected by a mountain range; four mountain ranges extend into city boundaries. Thousands of miles of trails crisscross the city and neighboring areas, providing opportunities for exercise and wilderness access on foot, bike, or horse. Across the county a great variety of outdoor activities are available, such as skiing, rock climbing, gold panning, hang gliding, and windsurfing. Los Angeles is home to adherents of many religions, with Roman Catholicism being the largest due to the high numbers of Latinos. The Roman Catholic Archbishop of Los Angeles leads the largest archdiocese in the country. With 621,000 Jews in the metropolitan area (490,000 in city proper), the region has the second largest population of Jews in the United States. The Azusa Street Revival (1906–1909) in Los Angeles was a key milestone in the history of the Pentecostal movement, not long after Christian Fundamentalism received its name and crucial promotion in Los Angeles. In 1909, the Bible Institute of Los Angeles published and widely distributed a set of books called The Fundamentals, which presented a defense of the traditional conservative interpretation of the Bible. The term fundamentalism is derived from these books. Los Angeles is also a major hub of the House Church Movement. Dr. Gabe Veas is one of the leaders of this group, pastoring the house church network known as Authentic LA. In the 1920s, Aimee Semple McPherson established a thriving evangelical ministry, with her Angelus Temple in Echo Park open to both black and white church members of the Foursquare Church. Billy Graham became a celebrity during a successful revival campaign in Los Angeles in 1949. Because of Los Angeles' large multi-ethnic population, there are numerous organizations in the area representing a wide variety of faiths, including Islam, Buddhism, Hinduism, Zoroastrianism, Sikhism, Bahá'í, various Eastern Orthodox Churches, Sufism, and others. Immigrants from Asia, for example, have formed a number of significant Buddhist congregations, making the city home to the largest variety of Buddhists in the world. Los Angeles currently has the largest Buddhist population in the United States. There are over 300 temples in Los Angeles. Los Angeles has been a destination for swamis and gurus since as early as 1900, including Paramahansa Yogananda (1920). The Self-Realization Fellowship is headquartered in Hollywood. Los Angeles is the home to a number of Neopagans, as well as adherents of various other mystical religions. One wing of the Theosophist movement is centered in Los Angeles, and another is in neighboring Pasadena. Maharishi Mahesh Yogi, considered a spiritual, rather than a religious leader, founded the Transcendental Meditation movement in Los Angeles in the late 1950s. The Kabbalah Centre is in the city. The Church of Scientology has had a presence in Los Angeles since 1954. The Walt Disney Concert Hall, designed by award-winning architect Frank Gehry, is home to the Los Angeles Philharmonic. 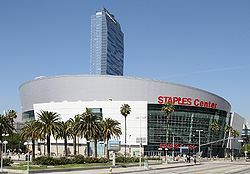 Staples Center, a premier venue for sports and entertainment, is home to several professional sports teams. 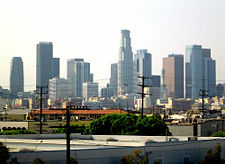 Due to geography, heavy reliance on automobiles, and the Los Angeles/Long Beach port complex, Los Angeles suffers from air pollution in the form of smog. The Los Angeles Basin and the San Fernando Valley are susceptible to atmospheric inversion, which holds in the exhausts from road vehicles, airplanes, locomotives, shipping, manufacturing, and other sources. Unlike other large cities that rely on rain to clear smog, Los Angeles gets only 15 inches (381 mm) of rain each year. Pollution accumulates over multiple consecutive days. Issues of air quality in Los Angeles and other major cities led to the passage of early national environmental legislation, including the Clean Air Act. More recently, the state of California has led the nation in working to limit pollution by mandating low emissions vehicles. As a result, pollution levels have dropped in recent decades. The number of Stage 1 smog alerts has declined from over 100 per year in the 1970s to almost zero in the new millennium. Despite improvement, the 2006 annual report of the American Lung Association ranks the city as the most polluted in the country with short-term particle pollution and year-round particle pollution. In addition, the groundwater is increasingly threatened by MTBE from gas stations and perchlorate from rocket fuel. Methyl tert-butyl ether, also known as MTBE, is used as a gasoline additive as an oxygenate and to raise the octane number. Although its use has declined in the United States in response to environmental and health concerns, it has been found to easily pollute large quantities of groundwater when gasoline with MTBE is spilled or leaked at gas stations. With pollution still a significant problem, the city continues to take steps to improve air and water conditions. The quantity of water is also an issue and the city actively promotes conservation measures, such as offering financial incentives to people who install water-efficient appliances in their homes. With so many immigrants speaking a large variety of languages at home, education in English can be challenging for many students. When language barriers are combined with a tight budget and a low ratio of teachers to students, the result is declining achievement levels in the city's schools. This issue will need to be addressed in order for the city to meet the needs of all its residents. ↑ Stafford, Leon, "Atlanta works on its sales pitch: Convention bureau's chief sticks to basics in marketing the city", The Atlanta Journal – Constitution, January 7, 2010, p. 1. Retrieved October 1, 2011. ↑ Smith, Jack, "A Teflon Metropolis Where No Nicknames Stick", Los Angeles Times, October 12, 1989, p. 1. Retrieved October 1, 2011. ↑ "'La-La Land,' now the dictionary definition of Los Angeles", Los Angeles Times, March 25, 2011. Retrieved September 29, 2011. ↑ Gazetteer. U.S. Census Bureau. Retrieved September 28, 2011. ↑ US Geologic Survey,Earthquake Facts. Retrieved December 13, 2008. ↑ National Drug Intelligence Center, May 2001, California Central District Drug Threat Assessment. Retrieved December 13, 2008. ↑ Census and You, January/February 1996, Getting to Work in the City. Retrieved December 13, 2008. ↑ U.S. Census Bureau, School District Interactive Tables. Retrieved December 13, 2008. ↑ Adherents.com, The Largest Jewish Communities. Retrieved December 13, 2008. Bancroft, Hubert Howe. The Works of Hubert Howe Bancroft. 1st Hand History. Retrieved December 12, 2008. Crewe, Sabrina. Los Angeles. Great Cities of the World series. Milwaukee, WI: World Almanac Library, 2004. ISBN 0836850297. Davis, Mike. City of Quartz: Excavating the Future in Los Angeles. London: Verso, 1990. ISBN 9780860913030. George, Lynell. No Crystal Stair: African-Americans in the City of Angels. London: Verso, 1992. ISBN 9780860913894. Glover, Paul. "Los Angeles: A History of the Future." Eco-Home Press, 1989. Retrieved October 17, 2014. Klein, Norman M. The History of Forgetting: Los Angeles and the Erasure of Memory. The Haymarket series. London: Verso, 1997. ISBN 9781859848203. Monahan, Torin. Los Angeles Studies: The Emergence of a Specialty Field. City & Society XIV (2): 155-184, 2002. Pitt, Leonard, and Dale Pitt. Los Angeles A to Z: An Encyclopedia of the City and County. Berkeley: University of California Press, 1997. ISBN 9780520202740. Reisner, Marc. Cadillac Desert: The American West and Its Disappearing Water. New York: Viking, 1986. ISBN 9780670199273. Theroux, Peter. Translating LA: A Tour of the Rainbow City. New York: Norton, 1994. ISBN 9780393036473. Ulin, David L. Writing Los Angeles: A Literary Anthology. New York: Library of America, 2002. ISBN 9781931082273. White, Richard. "It's Your Misfortune and None of My Own:" A History of the American West. Norman, OK: University of Oklahoma Press, 1991. ISBN 9780806123660. The Official Web Site of the City of Los Angeles. The Los Angeles Police Department. History of "Los Angeles, California"
This page was last modified on 25 July 2018, at 16:23.